ModelsMania Magazine. Interview. September 2012. A.D. Cook is a world renowned, Internationally established, master artist whose brilliant career spans decades and includes hundreds of spectacular artworks utilizing a wide variety of mediums.His creative imagery bursts out of traditional art forms leaving collectors marveling at the power, beauty and detail of his artwork. The very nature of his art provides lasting enjoyment and increasing value for his collectors. The international art community continues to recognize him as a pioneer in his genre. His original paintings on canvas and metal have been featured in magazines and books as masterworks. His art has been exhibited in fine art galleries from Key West to Hawaii, and he has been a featured artist at ArtExpo in New York City. Since 2002, large-scale figurative art has been his specific creative focus and passion. We are honored to have this opportunity to be featuring the amazing artist A.D. Cook. We love his work and have been a very big fan of A.D. Cook for many years. A.D. Cook specializes in life-size and larger-than-life figurative fine art nudes on canvas and metal. At a young age A.D. Cook had a passion to create stunning pieces of art. While he traveled along with his continually moving family, A.D. Cook developed his natural talent and loving passion for art. 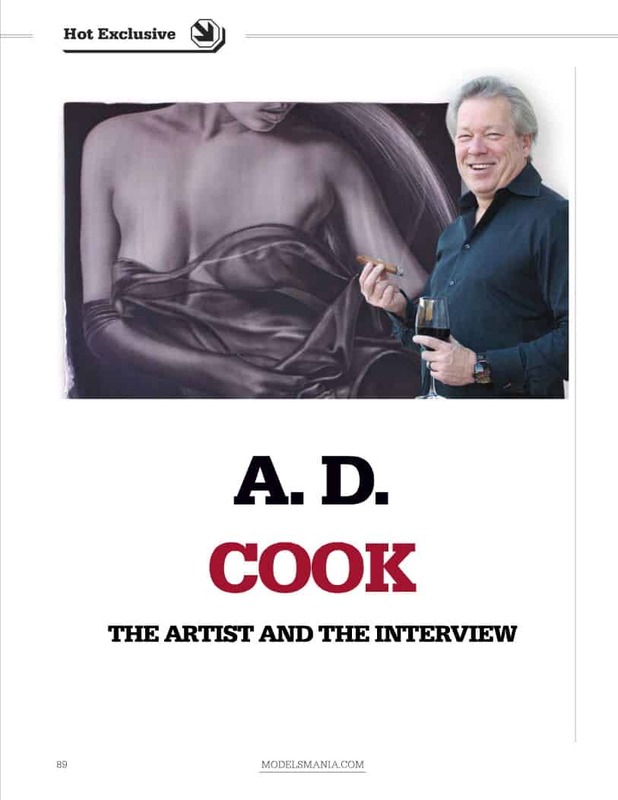 We hope you will enjoy this exclusive interview we were to conduct with A.D. Cook. When did you first learn you wanted to become an artist? Can you please tell the readers a little about your style of art? I celebrate natural female beauty through powerful larger-than-life figurative fine art nudes on canvas and metal. My painting style is realistic, yet idealized. My figures are typically created life-size up to about twice life-size on surfaces from around 12 to 24 square feet in size – sometimes larger. I enjoy an old-school, hands-on approach to everything I do in my studio. I take tremendous pride in the art that bears my signature. I firmly believe that art created-by-hand is essential, and quality and craftsmanship are a big part of that. My canvas paintings often incorporate pearls and other mixed-media elements like gold leafs. My metal originals include special grinds and effects that create holographic illusions making the art dynamic and always changing with the available light. The special treatment in my work doesn’t really translate to the Internet. I am often told that my original paintings are hard to appreciate by simply visiting a web site. They are designed to experience up close and personal. My paintings are dramatic in size, quality, texture and impact. Rich in detail, they can be enjoyed from across the room or from just inches away. They’re realistic to the point of being illusion, yet stylized enough to be attention holding. They are my creative expression as artist. Where do you get your inspiration for your artwork? Often, I get inspiration from music and movies, through my photography and also from my materials and tools. Sometimes my environment influences my art. Mostly, people as spiritual beings inspire me. My strongest inspiration comes from the beauty I find in the graceful lines of the female form – to me the ultimate beauty. There is nothing I would rather paint and my art is homage of that. Being an artist means having a lifestyle that makes creativity part of your everyday life. I truly enjoy engaging in the creative act of taking an idea born in your heart and manifesting it in the material world with your hands. I experience a tremendous pleasure in the creative process from concept through finished art. All that and I get to wear medical scrubs at work and drink wine in the afternoon. Do you have any favorite artwork you have created? Tough question – that’s like asking which of your children is your favorite. I’ve created several large paintings over the years, and as the saying goes, each new painting becomes your new favorite. I do have some particular pieces that I regard as uniquely specially over the years. Most recently, “Truth” and “Ascendant” from my Pearl Series, “Backdraft”, “Eclipse” and “Muse” from my earlier canvas figurative works, and “Beaujolais” and “Brooklyn” from my metal series. I’m a huge fan of so many artists, including several painters from the renaissance period (the classics), primarily Leonardo da Vinci, Michelangelo and Rubens. Among more recent artists, I’m a fan of sculptor Frederick Hart and painters Maxfield Parish, Audrey Flack and Chuck Close. Kenyon Cox’s pencil drawings are fantastic, and I’ve loved M.C Escher’s drawings since I was a kid. What do you think of today’s modern art? There is good and bad in everything and every type of art. I love the quote “Modern art is what happens when painters stop looking at girls and persuade themselves that they have a better idea” attributed to poet John Ciardi, but in reality, I like a lot of modern art. I’ve created many abstracts and other art over the years that could be considered modern art but always find myself returning to figurative as my primary focus. It’s important as artists that we continue to push the boundaries and challenge conventions. Modern art encompasses a lot of ground, from Van Gogh and Toulouse-Lautrec to Picasso to art created since. Some is good; some is great; some not so great. Today, there are more artists in the world than ever before, and there are unlimited options for collectors. Only time will tell the good from the rest. I’m still not convinced that two toothpicks glued to a shipping palette is art, but in the end that’s not for me to decide. What did you think about the late artist Bob Ross? I never had the opportunity to meet him, but from what I understand I would have to say that he had a kind heart and was a good instructor with a passionate fan base. He exposed a lot of people to the joy of creating art and exploring their creative side. A.D. Cook is our favorite Artist! Do you exhibit your artwork anywhere? Over the years, I’ve exhibited in galleries all over the U.S., including Key West, Scottsdale, Tahoe, Houston, San Francisco, Las Vegas, Hawaii and New York. Currently, I participate in luxury events with my art, mostly in Las Vegas and Southern California. Did you ever go to an art school or did it come naturally to you? Art came naturally for me. Art has been a lifelong passion and I’ve continuously endeavored to further my abilities and nurture my talents. When I’ve wanted to learn something new, I just dug in and did it. I’m a quick study and never afraid to make a mistake with art, because that’s how we learn. I’m fortunate to have also surrounded myself with amazing mentors and creative talents. My artist friends and I share our thoughts, knowledge and ideals on a regular basis, so in many ways it’s like being in art school all the time. Follow your heart and create what is natural and inspires you. This is different for everyone. Don’t try and do what others do because you see someone else experiencing success with it. Be honest with yourself and stay true to yourself and you’ll be true to your art. Create for yourself first. Be willing to experiment and make mistakes. You’ll learn more from your mistakes than art school and books can ever teach you. Success in art doesn’t happen overnight. Tenacity, time and passion are your greatest allies. What do you think the future will be for the art industry? I see a return to authentic art with more of a demand for artworks created by hand. It’s a dynamic change in perspective on what’s valuable in the art world. It’s happening. I’m constantly noticing that people want original art – something unique and special that only they have. At the same time, technology is constantly influencing artists and the art industry. We live in an age where everyone can have a Mona Lisa or Picasso hanging on their living room wall or Michelangelo’s David in the Fourier. Today’s collectors have choices. As artists, we are in a unique position to integrate the old with the new while innovating and breaking ground for the future. The possibilities as an artist today are endless. I’ve been fortunate and grateful to enjoy a lifetime of drawing and painting. 2012 marks a decade of creating figurative art as my primary focus and I still believe that my best work is before me. In closing, my hope is that, as artists, we create and share the beauty with the world – whatever that means in our own special way. There is plenty of ugliness in this world, but what is lacking is beauty, hope and vision. Beyond that, enjoy life to the fullest. Drink great scotch, enjoy quality wines and smoke the best cigars you can find. Create something that last for an eternity. Cheers! © Copyright 2012 ModelsMania. Posted with permission.